The room was great. Loved the double header shower. The location of this hotel is fantastic. Walking distance to everything in Moab. It was clean and tidy. The renovated rooms were nice. The beds were comfortable. The room was very clean and nice. We arrived late and check in was easy. Check out the next morning was also easy. We have stayed in many different hotels in Moab as we drive through it often. This was my far the cleanest we have stayed at. The room was very nice, clean and affordable. We were pleasantly surprised. Easy walking distance to shops and restaurants. Clean big rooms. There's a microwave and fridge. Near Arches National Park. there was no breakfast but was located within walking distance of several places to eat. Downtown Moab, perfect location. 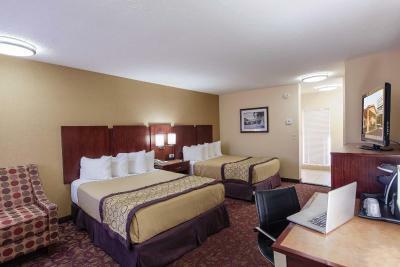 Friendly staff, clean renovated room, quiet, everything you need! 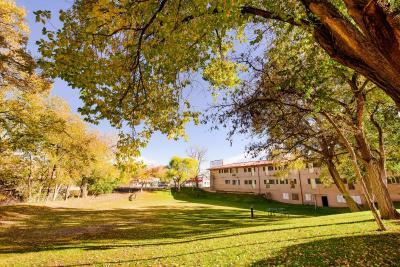 Hotel Moab Downtown This rating is a reflection of how the property compares to the industry standard when it comes to price, facilities and services available. It's based on a self-evaluation by the property. Use this rating to help choose your stay! 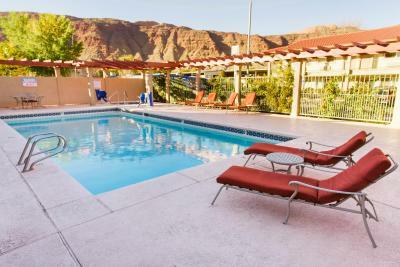 One of our top picks in Moab.Hotel Moab Downtown is located in the heart of Moab, with views of La Sal Mountains and surrounded by towering red rock cliffs. 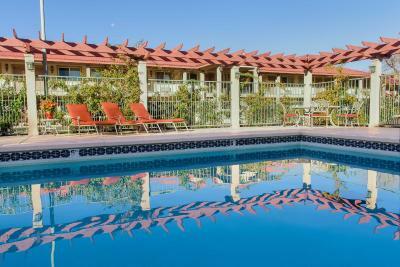 Guests can take advantage of a seasonal pool. The entrance to Arches National Park is 5.7 mi away. Each room includes a private bathroom. For your comfort, you will find free toiletries and a hairdryer. Hotel Moab Downtown features free WiFi throughout the property. A flat-screen TV with cable channels is available. Hotel Moab Downtown is the largest full service hotel in Moab and is next to shops, galleries, museums, restaurants, and much more. Activities in the surrounding area include golfing, hiking, sightseeing, mountain biking, 4-wheeling and outdoor adventures of every kind. Canyonlands National Park is 40 minutes' drive from the property. This is our guests' favorite part of Moab, according to independent reviews. When would you like to stay at Hotel Moab Downtown? This air-conditioned room features a cable TV and a hairdryer. 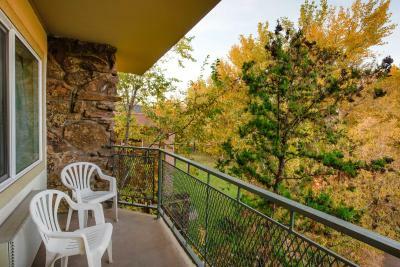 This single room features a balcony, cable TV and microwave. House Rules Hotel Moab Downtown takes special requests – add in the next step! Hotel Moab Downtown accepts these cards and reserves the right to temporarily hold an amount prior to arrival. Guests are requested to contact the hotel on the day of arrival for confirmation of special requests. A bit run down, carpet humid, entry door stuck shut, towels ripped, gentleman at check in not so friendly. Double-headed shower was wonderful. Location was excellent: can walk to the visitors center, restaurants and shops, right in Main Street. The lady at the front desk had terrible customer service. Super grumpy and almost condescending. Did not like outside staid to climb with luggage. Internet half the time no connection. Charged before arriving and could not split bill. Although i booked months in advance, we must have gotten the worst room in the entire complex (right on the street, ground level). Road noise was severe. Lots of noise in the ceiling as people upstairs walked in their room (really, it was crazy loud. I wondered if it was going to cave in!) The window screen had been pulled back. Toilet seat was loose. Hair dryer didn't work. The double room layout was great for us. The blankets filling were sparse. I reckon it lost its fullness after a wash ( at least they wash the blankets 😀. That said, we were comfortably warm. Location z comfortable bed and pillows. Although on the main road, the room was quiet and we slept well. Fix the room door so that it swings back to lock after the cleaners have been. We had a room with 2 beds; one was a bit saggy. Also, we never did get the Keurig to work. We booked the motel for the price and the pool only to be told the pool and hot tub were out of service when we got there but that the Best Western would let us use theirs. From the look of it, it the pool had been under renovation for some time. The Best Western is a block away, the pool is small and was full all night. The motel should put a notice on their website thatvtge pool is closed or under renovation. Pretty crappy!